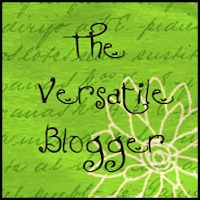 I've been awarded the "Versatile Bloggers Award" from a fellow Illawarra mummy blogger, My Mummy Daze. Sooooooo, before you go any further, pop on over to MMD and say hello. Go on. I'll wait. Just make sure you come back. Part of the terms and conditions of receiving this award include sharing seven facts about myself, that you would otherwise not have known. Are you ready to learn some more tidbits about little old me? 1. When I was little, I wanted to be a doctor. I thought that I could save the world (well my parents at least). But the drawback was that blood made (and makes) me squeamish, so that idea had to go out the window. 2. I'm a bit (or alot) of a rev-head and love car racing. I especially like Formula One (F1) and I ofcourse go for Mark Webber who is our Aussie driver. I used to work for Hertz so I got to test drive lot's of cars. 3. I have a pet goldfish called 'Daisy'. She a big white fish with orange spots. 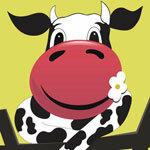 One day I hope to have a large enough piece of land to have a pet cow called 'Daisy'. 4. I like anchovies on my pizza and I eat the pickles after my kids take them out of a McDonalds cheeseburger. I don't like eggs. If they're in cakes, well that's fine, but gooey, slimey eggs with runny centres, just gross me out... unless ofcourse if they're Cadburys Creme Eggs. 5. I can cut keys. My first weekend job was in a hardware store and other than being the "checkout-chick", part of my job included cutting keys. It's not as hard as it looks - seriously. 6. My parents are from Portugal and I'm a first generation Aussie. I speak Portuguese fluently. I've been there 5 times in my life, but haven't been since around 1996. When my kids are older, I'd like to take them there to visit their extended family. 7. I'm a Twilight fan! Huge fan! I can't wait for the new film. Any other twilight fans out there? Edward or Jacob? So go ahead, do yourself a favour and check out these blogs. They're inspiring, funny, addictive and great reads. Congratulations! I'm going to check out a couple of the blogs I haven't seen before, thanks for the links! Apologies for taking so long to post it on my blog.